Manchester City recovered from a two-goal deficit to beat Championship side Swansea City 3-2, earning their place in the FA Cup semi-finals for the first time under Pep Guardiola. They had VAR - the lack of technology on this occasion - to thank after netting two dubious late goals. After Bernardo Silva's excellent strike halved the deficit with 20 minutes left to play, substitutes Raheem Sterling and Sergio Aguero proved pivotal. The former was adjudged to have been fouled by former Tottenham defender Cameron Carter-Vickers, but replays showed the American won the ball during his tackle inside the box. Aguero watched as his resulting spot-kick cannoned off the post, with goalkeeper Kristoffer Nordfeldt helpless to stop the strike from bouncing off his leg into the goal. Making his first start here since an injury lay-off sidelined him in January, Fabian Delph was City's poorest performer and stuck out like a sore thumb in defence. After 20 minutes, he made a needless sliding challenge on Connor Roberts inside the box and gifted the hosts a penalty. This had shades of his display against Wigan in this competition last season, where he was sent off during their shock away defeat by the Latics. Granted, left-back isn't his position but versatility is what he has been utilised for under Pep Guardiola and this display didn't provide anyone with confidence. He failed to offer anything in attack and was vulnerable defensively. With the midfield so stacked as it is, he'll never get an opportunity to play in his preferred role long-term and after a performance like this, you could argue Pep has lost his faith in the Englishman. As harsh as it may seem, perhaps it's time for him to seriously consider his options this coming summer. Oleksandr Zinchenko was immediately much better as soon as he was introduced and Delph is seven years his senior, despite neither being suited to that role. 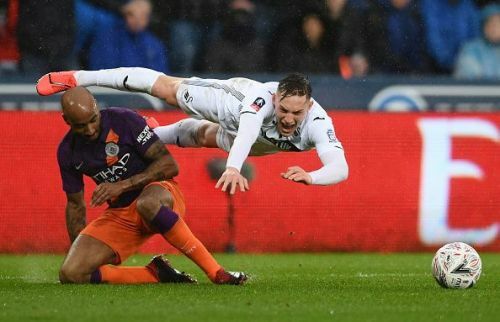 Forward-thinking, happy to track back and crucially confident, it was a telling sign and one which could see Delph's spell at Eastlands come to an abrupt end.